I first read about this targeted offer on FlyerTalk , where forum member Cannonball Run started this thread: Bose 1000 miles for listening to Video Wave (ends Nov 10 2011). Since it’s a targeted promotion, I figured it wouldn’t be of much interest to anyone that didn’t receive it the offer, so I never mentioned it. I’m writing about it now though, so that if you do receive the postcard you don’t overlook it and throw it away. I almost did. I was sorting through some junk mail yesterday, and if I hadn’t remembered reading about it at FlyerTalk I would have missed it and sent it through the shredder. Experience if for yourself. Now it’s your turn to discover what no other television can deliver. Exclusive Bose technology reproduces sound from places where there are no speakers, creating an experience you may never have thought possible. There is no sparate subwoofer. No speakers to install. And no wires in sight. Vist your Bose Store for a demonstration. You’ll earn 1,000 American Airlines AAdvantage miles just for listening. Plus you’ll earn another 10,000 AAdvantage miles if you purchase the VideoWave entertainment system. Please act soon – this offer ends November 10, 2011. Purchasers must visit a Bose Store to receive this offer. 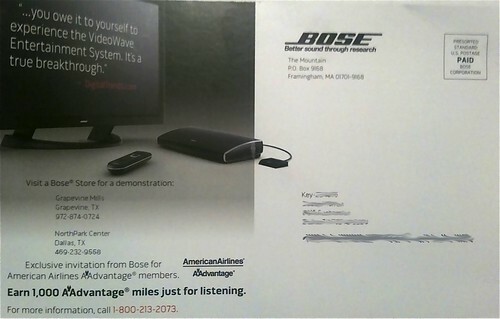 If visiting a Bose Store, bring this brochure to earn your AAdvantage miles. AAdvantage bonus mileage offer valid only on product advertised. If you’re really interested though and didn’t receive a brochure, you might try calling the telephone number on the card and asking Bose if they can send you one. The number is 800-213-2073.